00:00:32.08	a little mirror that then directs the sunlight onto the specimen. 00:00:35.21	So that used to be the brightest light source we could find. 00:00:39.03	Nowadays, we're more inside and we're using devices like those standing here. 00:01:11.12	then through a condenser lens be transmitted into our microscope. 00:01:38.05	of the filaments, that lens will make a magnified image of the filament. 00:02:15.04	bright. And for things like fluorescence, we really want brighter light sources. 00:03:13.04	so that it comes out in the front. So you get more light coming out. 00:03:24.01	and that is because you have to replace them after about 200 hours. 00:03:56.09	we have a so-called metal halide illuminator, it's also a lamp. 00:04:04.02	And that thing just clicks in here, there's no alignment that needs to be done. 00:04:27.28	end. So when I now assemble this and fire it up here. 00:04:44.26	lamps is that they don't like to be switched on and off very often. 00:04:49.14	So you know, once they're on, leave them on for at least an hour or so. 00:05:55.13	select which wavelength you would like to use. 00:06:34.16	don't want to get that beam of light hitting your eyeball ever. 00:06:43.25	this very bright spot of green laser light coming out. Most light sources under the sun (sun included) can be used in microscopy. 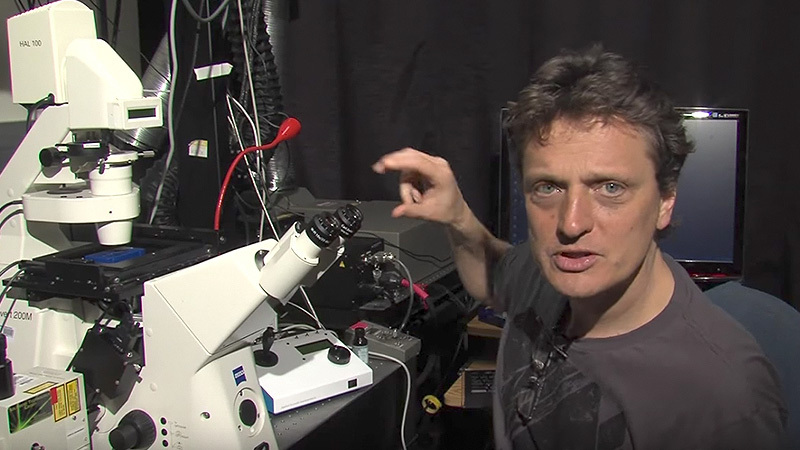 In this talk about light sources for microscopy, Nico Stuurman shows a few examples of light sources that are currently used in microscopes, including Halogen lamps, Metal Halide burners, LEDs, and lasers.